GLADSTONE PARK — Hitch Elementary School Principal Debby Reese points out students learning in every nook and cranny as she tours the top-rated school on the Far Northwest Side. A class studies in what was once a men’s bathroom. The defunct projector’s booth in the school’s auditorium has been converted into a room for the school’s speech therapist to work with students. 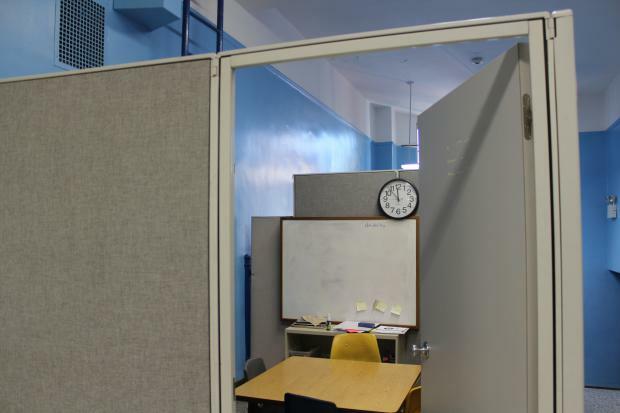 And the school’s hallways are dotted with cubicles that serve as classrooms — despite the hubbub caused by students passing from one subject to the next. “We use our space as creatively as possible,” said Reese, who has been at Hitch for 10 years. Hitch is among the most overcrowded public schools in Chicago, but pleas to build an annex or simply set up extra classrooms in mobile buildings have fallen on deaf ears at Chicago Public Schools headquarters, parents, school officials and Ald. John Arena (45th) said. The school, at 5625 N. McVicker Ave., has 585 students in a building that has an ideal capacity of 450 students, Reese said. That would give the school an utilization rate of 130 percent, which is among the highest on the Far Northwest Side, an area where most schools are bursting with students because of an influx of families looking for affordable homes in a relatively safe area of the city. CPS is exploring options to relieve overcrowding at Hitch, but no decisions have been made, according to a statement it released. Although Reese said she she used to worry about CPS officials closing Hitch because it was once underenrolled, she now has the opposite problem, with 45 more students attending Hitch this year than last. The school first requested a four-classroom mobile annex five years ago to cope with the population boom, Arena said. Arena was one of several community members who volunteered recently to demolish the marble fixtures of an unused men’s room so it could be turned into a classroom. The marble was salvaged and may be used in a future public art project in the 45th Ward, Arena said. Arena said he was especially frustrated that Hitch was not included in a spate of announcements made by Mayor Rahm Emanuel last month that detailed more than $90 million to be spent on new science labs and playgrounds, a new school on the Southeast Side and annexes to lessen overcrowding. Among the schools that will get new annexes are Wildwood Elementary School in Edgebrook and Water Payton College Prep. “CPS capital spending has been politicized,” Arena said, adding that the annexes planned for Wildwood and Payton benefit parts of the city the mayor hopes to win in his 2015 re-election campaign. Coupled with a call for more charter schools on the Far Northwest Side, the CPS approach to capital funding is “fundamentally flawed,” he said. Overcrowding is especially acute in the lower grades, especially in kindergarten and first grade, where each class has more than 30 students, Reese said. “That’s just way too many,” Reese said, especially since the school, given CPS' highest level 1 ranking, emphasizes group work and collaboration. Hitch Local School Council member John Garrido, a police officer and lawyer who is considering challenging Arena in the 2015 aldermanic election, said every other school that is 30 percent to 33 percent overcrowded has gotten an annex or a mobile classroom. Hitch’s official enrollment is 546 students, according to data provided by CPS. That does not include the students who attend prekindergarten at the Gladstone Park school. CPS officials have encouraged Reese to stop offering prekindergarten because of the space crunch, she said. CPS officials also have suggested the school turn its lunchroom and library into classrooms in response to complaints about overcrowding. CPS officials expected 559 students in kindergarten through eighth grade to attend Hitch this year. Because fewer students enrolled at the school this fall, Hitch stood to lose an additional $54,400 under the new student-based budgeting system. Reese said she was relieved CPS officials decided to delay implementing the system for schools that would have lost funding, since she already had to severely cut the school’s budget in the spring in the first round of budget cuts. However, Hitch lost nearly $30,000 in money designated for low-income students and as part of the federal No Child Left Behind act. “I’m still trying to shave down the budget,” Reese said. Despite the cuts, the school did not lose any teachers.